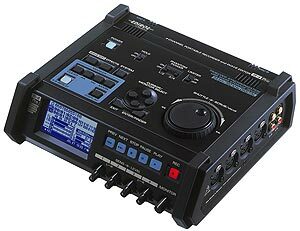 IF YOU ALREADY OWN A ROLAND R-4 PRO YOU MAY STILL PURCHASE SOME OF ITS ACCESSORIES FROM OUR R-4 PRO WEBSHOP BELOW. The R-4 Pro shares the R-4's rugged construction, robust feature set plus great sound quality, and it adds even more professional functions such as AES/EBU support, SMPTE time code and even better mic preamps. Its 100% bigger 80GB hard drive will store up to 125 hours of high quality audio, and you can record up to four channels at 24-bit 96KHz and monitor each channel discretely. The addition of a durable 4-pin DC input jack allows for standard film/TV industry battery packs to extend your record time. You can plug in any standard USB drive and enjoy fast back-ups of your projects. Like the R-4, the R-4 Pro has on-board effects and WAV editing features. Geared for pro videographers and recordists, the R-4 Pro delivers professional sound and features in a package that everyone can afford. Why are 4-channels of audio better than 2-channels? Capture more ambient sound at any shoot for an overall more convincing soundscape. Place mics on each participant in conferences, panels, reporters, etc. Redundancy or backup in case of camera mic noise or drop out. Simplify wedding (and similar) shoots with a mic on the bride, groom, officiator and a mic for ambient sound. Video editing environments now support multi-channel audio as standard. What additional features does the R-4 Pro have? 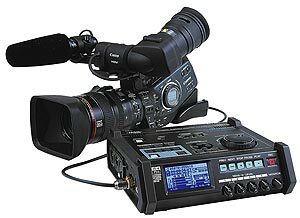 The R-4 Pro accepts SMPTE time code which enables it to slave to video cameras or VTRs. Four channels of high quality audio can be fully synchronized with video. In addition, the R-4 Pro can also act as the master, sending out time code to slave devices. 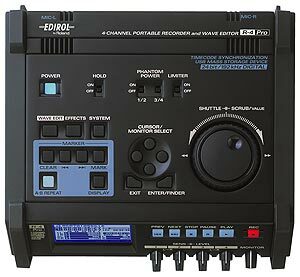 The R-4 Pro is equipped with XLR style AES/EBU digital Input and Output. The USB host terminal of R-4 Pro enables high speed and instant backup of recorded data to affordable and easy obtainable media like Flash Memory, Memory Cards via card reader or HDD storage. Easy and high speed duplication of recorded data improves production workflow across multiple locations. The R-4 Pro is equipped with a 4-pin XLR type battery power input. This enables power supplies from industry standard battery manufacturers for video cameras such as Anton-Bauer, etc. Additional flexibility in power options include AA type battery power or AC power (via adapter). Individual monitoring of all channels is enabled via the four analogue outputs. This allows precise monitoring of all recorded audio. 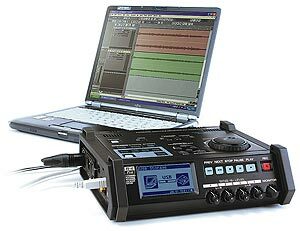 Equipped with a 80GB hard disk drive, the R-4 Pro can record a stereo audio file for approximately116 hours at 16bit/44.1kHz/ 106 hours at 16bit/48kHz, 70 hours at 24bit/48kHz, 34 hours at 16bit/96kHz, and 30 hours at 24bit/96kHz. Totally uncompressed recording assures outstanding sound quality. Choose 16-bit or 24-bit quantization and a sampling rate of 44.1 kHz, 48 kHz, or 96 kHz. Save data as WAV files. The 4 XLR/Phone combo jacks come with switchable phantom power and give you a choice of MONO, STEREO, STEREO X2, or 4CH recording. Digital input/output is also provided. Four-channel recording gives you exceptional flexibility. For example, you can use mics to capture the ambience of a performance hall while using line input to record the performance itself. Or you can record at several different level settings simultaneously. Built into the analogue stage, the Limiter helps deliver a stable and reliable recording free of clipped noise from sudden input surges. The R-4 Pro's omnidirectional, back electret condenser microphones offer superb transient characteristics and vibration resistance. When the REC button is pressed, the current material is appended to a buffer that contains recorded material from a few seconds earlier. This helps prevent missed recording opportunities or sound bites at the beginning of a recording. Just like the R-4, the R-4 Pro lets you tailor the sound during both recording and playback. The R-4 Pro is all you need to edit waveforms. Just watch the waveform on the LCD as you edit. Scrubbing playback with the shuttle dial lets you set the edit points precisely by sound. Press the mark button anytime during recording or playback to mark that point for easy, instant indexing later. With the A-B repeat function you can set two points and repeatedly play back the material between them. Use the jog dial to fast-forward or rewind at any of seven speed levels. The R-4 Pro's built-in speakers make it easy to monitor recorded sound without headphones. The USB 2.0 high-speed mode transfers data about 20 times faster than DAT. You can also use the R-4 Pro as a 80GB storage device. Edit R-4 Pro files directly from DAWs and other applications. Exchange data with other digital equipment while maintaining fidelity with the coaxial digital audio in/out. Like the R-4 shown in our photo (right), the R-4 Pro comes with a soft carrying case with a shoulder strap for safe, comfortable use in the field.